NEW: Use Harvest as a Data Source – How can we help you today? To create a data source using Harvest, go to the New Data Source page in Klipfolio and select the Web Accessible Resource option. In this example, we will use JSON as our data format. However, you also have the option to use XML. XML format uses a very similar structure to the JSON format. 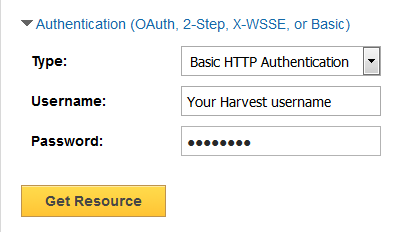 You can authenticate using Basic HTTP authentication (your Harvest login credentials). At Username enter your Harvest username. At Password enter your Harvest password.